Maybe it’s me, but it feels like there is so much new beer coming into St. Louis, that I’m not sure where to begin. Just last week, we got word from our friends at Craft Republic, that Off Color Brewing, out of Chicago, was now going to be released in St. Louis. Now, they’re ready for their first major release into the market, with Wari. Wari, was brewed in collaboration with the internationally famous Field Museum. The beer was inspired by the museum’s discovery of an ancient brewery in Peru and a thousand-year-old recipe. Woza. Legend has it that a thousand years ago, the Wari people built a brewery on a remote mountaintop in southern Peru where they brewed enormous batches of chicha, a corn-based beer that they consumed in copious quantities. When the empire’s reign came to an end around 1100 AD, the Wari set fire to the brewery and smashed their ceramic drinking vessels into the ashes of the burning building. Fast forward 10 centuries, Field Museum scientists discovered the remains of the brewery in 2004, and based on analysis of residues from the drinking vessels, learned that the beer was brewed with berries from the Peruvian pepper plant (also called molle berries). 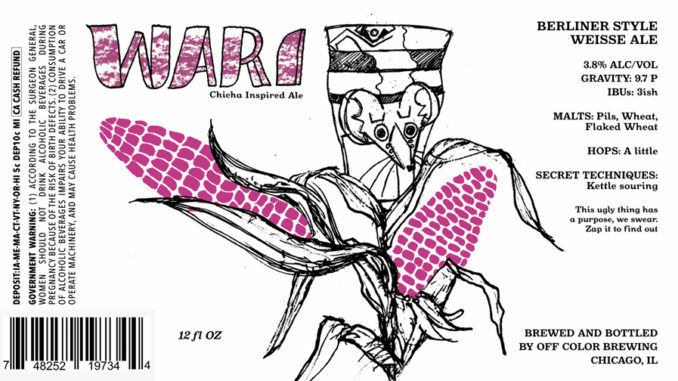 Wari is based off that ancient corn-based beer or chicha. The new version pours a deep pink color from imported Peruvian purple corn. On the nose you’ll find aromatics of mild pepper that complement a nice funk and fruit acidity reminiscent of cranberry juice without the sweetness. Wari is a Berliner Style Weisse Ale, and is not a big beer with an ABV of just 3.8% and a IBU of 3. The beer is available all across St. Louis starting today.